Bring the sugar, water, and Pandan leaves to a boil, reduce the heat and simmer for about 8 to 10 minutes. Let cool slightly and discard the pandan leaves. In a large bowl, mix the rice flour, tapioca flour, coconut milk, sea salt and the sugar syrup. Stir until well blended and let the mixture rest for an hour. Strain the mixture and divide into 2 portions. Set aside one portion uncolored and about 4 to 5 small drops of red coloring to the other portions. Place the greased pan in a steamer over high heat. Start with the colored mixture, pour ½ cup into the pan, set the timer for 6 minutes, and wipe the pot cover after every layer is done. (Stir the batter every time before pouring the next layer.) Continue with the uncolored layer and keep alternating the color layer, add a few extra drops of red coloring for the 9th layer, stir well and pour it over the steamed layer and steam for about 10 minutes. 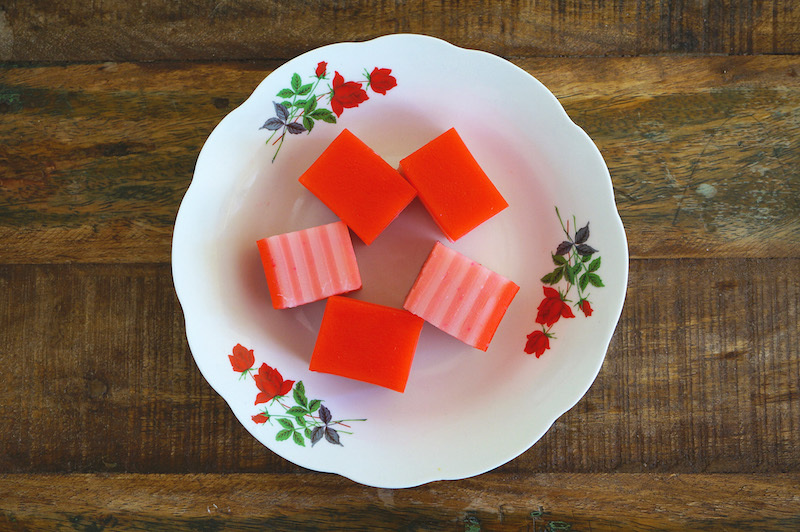 Remove from the steamer and let cool completely, about 5 hours, then cut the kuih into desire shapes and sizes. My sister's favourite kueh when she was young. She used to peel each layer and eat them layer by layer. The ones I see usually have more random rainbow colours though, but I love these shades ofpink! 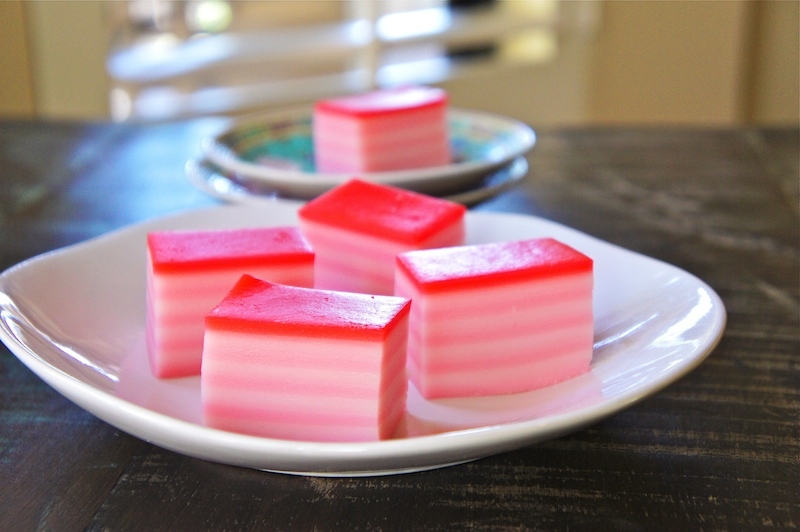 Your Kuih Lapis is such a perfect in terms of layers as well as the colours. Lovely! Amazing! Just like store-bought ones!!! Lovely! This looks and sounds so similar to the Thai dessert khanom chan, which is one of my all-time favorites! Pretty treats...I would love to have these for small all-girls get together, when you are not really thinking of filling your tummies to the brim, but you want to have good food and fun conversations. Looks fun to prepare in the kitchen too. A must try! I have made dodol before and that went well. I have seen these pretty sweets on many blogs but I think I will have to watch a video or two before I make these on my own. Yours look so dreamy and picture perfect! Love the pink colour and the layers are perfect. Do you use coconut oil for greasing the pan or something else? now you got me craving for this! love the sweet pinks and reds you've used! I have alwaya wanted to try to make this. It looks great. I remember when I ate it when I was a little kid, I used to eat it layer by layer. It seems my children have taken it from me. Whenever I make this kue lapis, they'll eat it layer by layer. Very nostalgic :) Glad to find your blog. I used this recipe two days ago because my Aunty recommended it. She also recommended I used coconut cream instead of milk (which I ended up doing). I really liked it, although I think next time I should just stick with coconut milk, which you had specified, because the coconut was a bit too strong for me. Just a minor thing: I found the texture a little powdery. Is it because I used coconut cream instead of coconut milk (this is what I suspect)? And could I also increase the tapioca flour to rice flour ratio to obtain a more jelly-like consistency? I think the powdery texture is due to the coconut cream. As for the ratio of flour, you can always change up to your liking. Just tried this recipe, need to wait for 5 hours to cool. I cant wait to dive in. Looks really nice and wasn't too difficult to make either. Thank you for this recipe! I'm glad it turned out well for you, and thanks for the feedback.